And the glory goes to….?! The Biggest Loser: Glory Days crowned its winner in a live finale special which aired on Thursday, Jan. 29. After months of prepping, training, crying (for some! ), and dieting, the three remaining finalists — Sonya Jones, Rob Guiry, and Toma Dobrosavljevic — displayed their accomplishments on a scale before a Studio City, Calif. audience. Below, Us Weekly has exclusive interviews with the winner, as well as the remaining finalists. Find out what they had to say about their journeys and more! The winner, Toma Dobrosavljevic, took home the grand prize of $250,000 after dropping 171 pounds and weighing 165 pounds by the finale. Dobrosavljevic, a project manager from Addison, Ill., had the highest weight loss percentage in comparison to the other two finalists, and was proclaimed the victor. "I feel incredible," he beamed to Us after winning the 16th season. "It’s so mind-boggling and overwhelming, I look in the mirror and I still have a hard time recognizing myself. Knowing that I’ve lost, in the last year, over 200 pounds, it’s just amazing. I started the show at 366 but at the beginning of the year I was 377 — to get to where I’m at, I’ve lost an entire person and a little bit more. It’s unbelievable." PHOTOS: Celeb weight loss — before-and-after pics! As for how the 33-year-old plans to spend the cash prize? "I know it’s a lot of money for me, I have a few things I’d like to do," he told Us. "My bosses have helped me financially be here, they gave me time off of work and they’ve loaned me some money. I need to make sure I pay them back." Not one to forget his family, he continued: "My mom, I’d really like to be able to help her with her mortgage and make sure she is stress-free and doesn’t have to worry about that stuff. If I have anything left over, maybe some school loans and maybe a little bit of a wardrobe. I definitely want to make sure I help my family out and everyone who has helped me out along the way. Without them, I wouldn’t be here today." 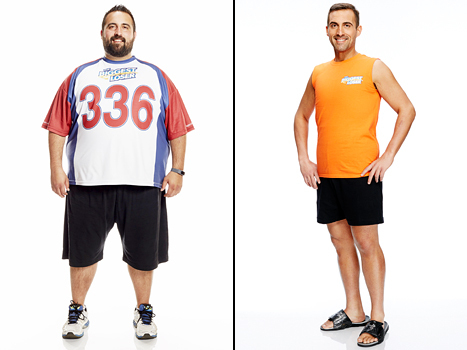 First runner-up was Jones, a gym teacher from Springfield, Ill., who shed 144 pounds and weighed 139 pounds by the season finale. "One pound — who would have thought?" she told Us. While Jones didn&apos;t win the overall competition, she gushed: "Quite frankly, we’ve all won… I feel amazing. This has been the best journey of my life, it’s fantastic." Jones sweetly added of the victor: "If I lose, I lose to a great man. Toma is the best." 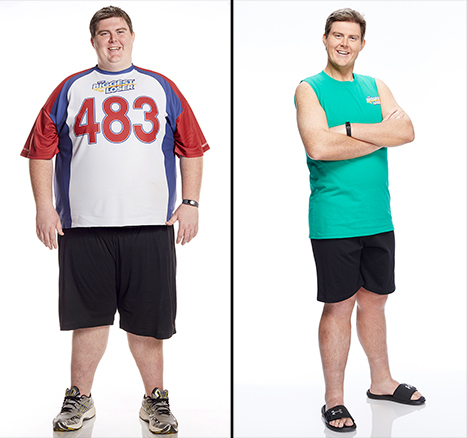 Second runner-up was Guiry, who first weighed an astounding 483 pounds when he joined The Biggest Loser. Guiry&apos;s commitment to his weight loss regimen — exercise and healthy eating habits included — led him to drop an impressive 238 pounds by Thursday, leaving him at a cool 245 pounds. "I&apos;m wearing a 38 pants and a large, tall shirt," Guiry told Us. "I was wearing 5 XLs… It’s a totally different life." He reflected back to when he first started his stint on The Biggest Loser, and said his physical transformation is just one part of an overall personal change. "I was at a place in my life where I was angry at myself for letting my weight get so out of control, and the only person I could blame for that was me," the rugby coach from Springfield, Mass., told Us. "Until I fixed that part of myself, I was always going to be angry. I feel like now throughout this process, I’ve done that and I can forgive myself for letting myself become so overweight. I’m a much happier, healthier person. I’m 26 years old, I have doubled my life expectancy, and I’m just ready to dominate life!" Tell Us: Did Dobrosavljevic deserve the win?